Per TB&P, The city of Centerton agreed at auction Thursday (Feb. 28) to purchase a 20-acre lot on Keller Road in Centerton for $598,840. The purchase price equals $0.34 per square foot. Thursday’s absolute real estate auction was conducted by Hot Springs-based Wilson Auctioneers Inc., and included three parcels totaling about 38.3 acres at the northwest corner of Keller Road and Arkansas Highway 102. Norm Banwarth paid $919,160 for the remaining two tracts, which includes a 1,988-square-foot residence and frontage along Highway 102. The purchase price of that property equals $0.55 per square foot. Centerton Mayor Bill Edwards said the fast-growing city will develop the 20-acre site but a specific use hasn’t been determined. He mentioned the possibility of additional sports fields. The city built the 17-acre Kinyon Sports Complex off Gamble Road near Centerton Gamble Elementary School in the past two years. It has four fields for baseball or softball and a multipurpose field for football or soccer. The 38-acre site was once a turkey farm and homestead owned by Laurence Keller. The owner at the time of the auction was Keller’s daughter, Connie Cloe, president of Jack White Hatcheries Inc. The land has been family owned since 1964 and is currently zoned for agriculture use. Chuck Dicus, a Wilson Auctioneers agent, said he showed the property to several prospective bidders from Arkansas and surrounding states in the weeks leading up to the auction. Per TB&P, Groundbreaking for a new neighborhood in southwest Rogers was held June 14. The $4.2 million project is called Savannah Estates, located on Wallis Road and situated between the Liberty Bell South subdivision and Pinnacle Memorial Gardens. The land owners are John George of Springdale and Nathan Fairchild of Rogers. 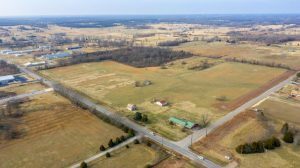 Their JONA Development LLC acquired the land (20.75 acres) earlier this year in two separate deals for a combined $905,000, which equals $1 per square foot. The previous landowners were the Blevins family (4.83 acres) and a limited liability company owned by Johnelle Hunt (15.92 acres). Savannah Estates will have 57 single-family lots, and Buffington Homes of Fayetteville is the exclusive homebuilder and developer. The company’s in-house real estate division, Neighborhood Realty, will be the exclusive listing agent. Clay Carlton, a principal of Buffington Homes, said homes in Savannah Estates will range from approximately 2,900 square feet to 3,700 square feet, and in listing price from $115 to $135 per square foot. He compared the neighborhood to another Buffington Homes neighborhood in Rogers, Silo Falls. Bates & Associates in Fayetteville is the civil engineer and Adams Excavating in Rogers is doing the excavation and site work. Lots could be ready for construction by the end of the year. Grand Savings Bank in Bentonville is the primary financier the project, with a one-year construction loan of $2.15 million. Per TB&P, Caterpillar officials announced Thursday (July 5) plans to invest $40 million in the company’s North Little Rock plant and add more than 250 jobs as part of an expansion to make paving equipment. An estimated 525 people now work at the plant.